Although most people think of it as the “new kid on the block,” Pattaya City Hospital has actually been around since May 2013. At the Sunday, January 17 meeting of the Pattaya City Expats Club, the services provided by the hospital were described by three hospital representatives; James Nanakornpanom and Paritsada (Corn) Ransibrahmanakul, both from the international marketing department, and Dr Natthawat (Kaopan) Kleebchan, an anaesthetist from the medical staff. James is half Thai and half Salvadoran. He has been in Thailand working for Thonburi Hospital Management group for 4 plus years in Phuket, Bangkok, Pattaya, and a few projects in China as well. Currently, he is the hospital’s manager of international marketing. Corn is Thai and has worked in marketing with the United Nations for the UNHCR and World Animal Protection for 3 years in Bangkok. Currently, Corn is the hospital’s marketing executive. 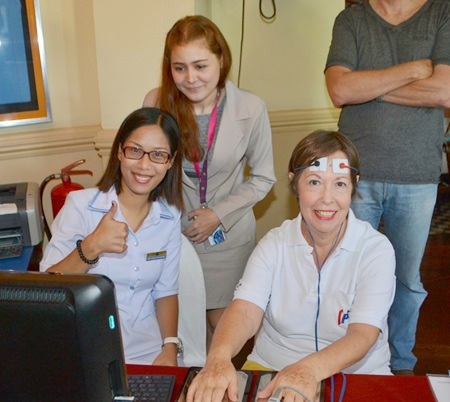 Pattaya City Hospital presenters brought along nurses to give free blood pressure checks for members and guests at the PCEC meeting. The Pattaya City Hospital was built by the City of Pattaya as a community hospital. It has five floors with information, outpatient services and the pharmacy on the ground floor. Specialist centres are on the second floor and inpatient beds/ICU are on the third. VIP facilities are on the fourth floor, and there are rooms for meetings on the fifth. James explained that Pattaya City Hospital is a secondary health care facility, which means that it does not provide the full range of services that one would find at a tertiary care facility in some government and private hospitals such as Banglamung Hospital or Bangkok Hospital Pattaya. Dr Natthawat (Kaopan) Kleebchan, an anaesthetist from the Pattaya City Hospital describes the medical care currently available for Thais and foreigners along with additional services that will soon be added. The hospital is located on Soi Buakhao, 500 meters south from the Soi Diana and Soi Lengkee intersection; it shares the entrance to the Pattaya fire brigade station. It is open Monday to Friday from 08:00 to 16:00 for outpatient services, but it also has a 24-hour emergency centre and inpatient care. Dr. Kaopan said that Pattaya City Hospital has specialists in internal medicine, X-ray, orthopedics, physical therapy, pediatrics, gynecology and anesthesia. The hospital also has a general surgery department, a delivery room, an intensive care unit and a dental centre. James Nanakornpanom and Paritsada (Corn) Ransibrahmanakul answer questions from their PCEC audience. They also mentioned the recently added International Information Desk with English speaking staff; a first stop for expats and tourists seeking medical care at the conveniently located Pattaya City Hospital. Further, she said that the hospital is known to have a strong orthopedics department offering total knee replacement, total hip replacement and arthroscopy (a minimally invasive surgical procedure on a joint). The department has a trauma centre that treats problems with the spine and legs; arthritis; and sports injuries. Additional services will be offered in the near future, including a heart centre, a kidney disease clinic, a general check-up centre and an eye department. 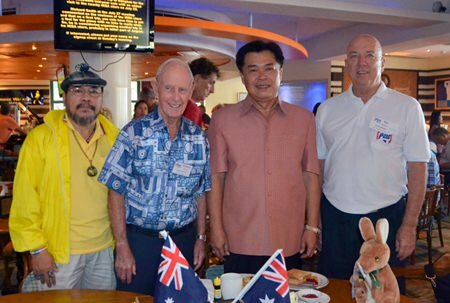 Dr. Kaopan mentioned that the Pattaya City Hospital provides an outreach service to people on Koh Larn. James and Corn explained that the hospital has common wards, private rooms and V.I.P. rooms. The charge for the private rooms is 2,200 baht a night. For the V.I.P. rooms, it is 6,000 baht a night. The fee to see a doctor is 500 baht, a rate set by the government. These are the rates foreigners pay as the government mandates the fees charged in all government hospitals; foreigners pay higher rates than Thais, but it is still less than what private hospitals charge. The Pattaya City Hospital is officially classified as a government hospital, but James referred to it a hybrid because in addition to receiving government funding, it is operated by staff from Thonburi Hospital, a private hospital in Bangkok. This means that the hospital can offer some services that are comparable to those in a private hospital, and it can offer them at lower prices. 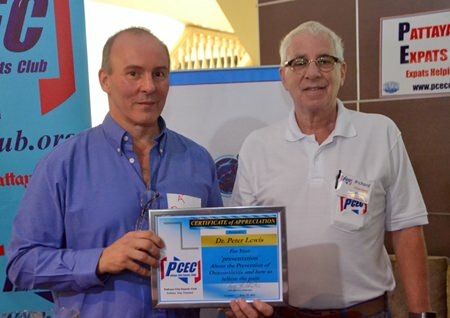 MC Richard Silverberg presents the PCEC’s Certificate of Appreciation to James Nanakornpanom, Corn Ransibrahmanakul, and Dr Kaopan Kleebchan for their informative presentation on the medical care available from Pattaya City Hospital. The hospital provides ambulance service. For the moment, patients have to call the general hospital number (038 103 900), but the hospital has filed a request with the government for a four-digit number for this service. A recent addition to the hospital they mentioned is an international reception desk in the main entry area. It is staffed with personnel that speak English and some other languages. So, if you are an expat or tourist, you should start at the international desk. 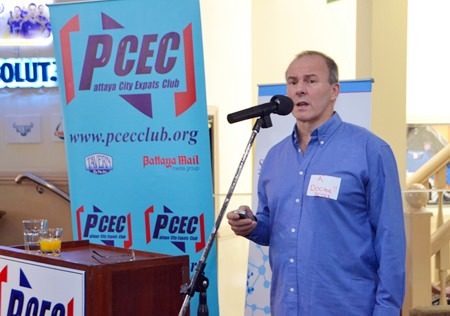 At the conclusion of the presentation, MC Richard Silverberg brought everyone up to date on club and other events and called on Roy Albiston to conduct the Open Forum, where questions are asked and answered about expat living in Thailand, especially Pattaya.